NOTE: The Joule app now requires camera access to scan Joule Ready preview packages. Learn more about Joule Ready and sign up for the preview at ChefSteps.com. Get access to the best sous vide recipes and control Joule, the world’s smallest, most powerful sous vide tool, with the Joule App. From raw to ready, the app coaches you through the whole process, so cooking sous vide is simple. Just pick what you want to cook, and we’ll walk you through the rest. 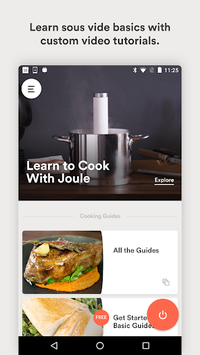 The Joule App includes groundbreaking features like Visual Doneness, precise temperature control from anywhere, and a robust collection of recipes and cooking guides created by the ChefSteps team. Joule and its app were built and designed from scratch to work together, and we’re just as dedicated to the quality of our products as we are to the food we make with them. You can read more about Joule and the Joule App in publications like CNET, Wired, Lifehacker, Food & Wine, and Network World. HOW DOES THE JOULE APP WORK? You tell us what you’re cooking, we tell you when it’s ready. Making a two-inch steak? Great. Just tap the Start button, and Joule will set a timer for perfect doneness. Get notified when your steak is ready—and we’ll also tell you how much longer it can stay in the water without overcooking. WHAT IS INCLUDED IN THE JOULE APP? 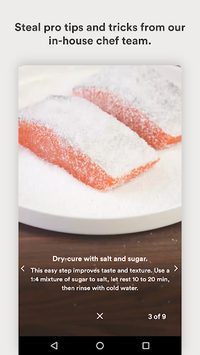 • Exclusive access to our cooking guides: The app comes with step-by-step guides for everything from perfect fried chicken, to succulent salmon, to the best steak you’ve ever had in your life, helping you unlock the power of sous vide. What’s even better? We’ll keep adding new guides (and updating old ones) all the time. • Visual Doneness: Choose exactly how you want your food to look when it’s done, then press go, and Joule does the rest. No more filtering through online forums to get the information you need. Visual Doneness takes the guesswork out of sous vide. • Step-by-step instructions, so you can learn as you go: Every cooking guide comes loaded with quick videos that’ll teach you new techniques and help you get the best results. • Notifications that let you know when your water is hot and your food is done, no matter where you are. Not ready to eat? We’ll tell you how much longer your food can stay in without overcooking. • Bluetooth and Wifi control, so you can cook from anywhere. Chefs have been cooking sous vide for decades to get perfect proteins and amazing new textures. But, it’s not fancy or complicated—Joule heats water to a very specific temperature, so you can cook food gently, with super-human precision. The water never gets hotter than you want the food to be, so it won’t overcook. HOW DO I GET JOULE? Visit chefsteps.com/joule to learn more. CAN I STILL USE THE JOULE APP IF I HAVE ANOTHER SOUS VIDE TOOL, LIKE NOMIKU, SANSAIRE, OR ANOVA? Absolutely! 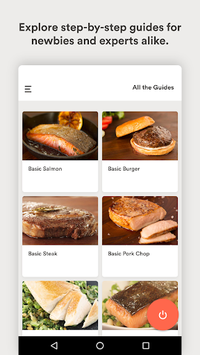 You can still use our sous vide guides and Visual Doneness in the Joule App to figure out your favorite times and temperatures, then manually set your other tool and make amazing meals at home. By downloading, installing or using the Joule app, you agree to the End User License Agreement. Currently, this app is only available in English.